Alot of people are thinking about having Cosmetic Injections but are not necessarily talking about it with their friends for fear of being judged, mislead or misinformed. It is each individuals personal choice to have the treatment or not. So here we are going to provide you with some information regarding Botox, then leave it up to you. 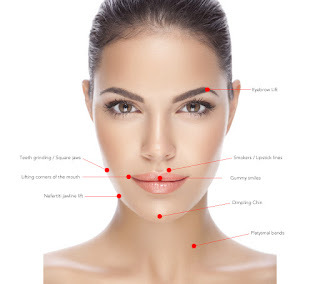 Botutinum Toxin commonly known by the trade name Botox, is a protein produced by neurotoxic bacterium. Botutinium Toxin blocks neuromuscular transmission, ie, paralyses and weakens muscles for a period of time. There are many uses for Botox such as Cosmetic, Sweating, Chronic Migraines & Muscle Spasms. Once a wrinkle forms, you can prevent it from deepening further with the use of Botox. The theory is that if muscles are unable to contract and perform the action, the muscle will become weak, therefore preventing the wrinkle from deepening. The short answer - ANYBODY! (requiring that they have had a full and thorough consultation with the medical practioner injecting to ensure they are suitable to have treatment). Traditionally Botox has been a popular treatment for people in their forties, fifties and sixties, treating deep and fine lines to help turn back the hands of time. But recent records show that more and more younger people in their late twenties and thirties are now having treatment. Younger generations are deciding to go ahead and have a small dosage of treatment as an anti-aging preventative measure. The optimal goal for patients undergoing Botox, is to not have that "Stunned Mullet" look, but more a softer and natural looking appearance. The time varies in each individual how long it lasts as your bodies metabolism breaks it down. Generally speaking it is around 3-6 months. The more frequently you have it done, the weaker the muscle becomes and therefore your frequency or dosage can become less. Cosmetic Injections should only be injected by a Medical Professional who has specialised training. At Bella Spazio, we are proud to have Dr Nair visit us to provide this service. Dr Nair has over 25 years experience in the Cosmetic Injections Industry. She provides a fully professional and discreet service and is a popular doctor, trusted by many. Dr Nair will next be visiting Bella Spazio on Saturday 26th November. The only question left for you is "Should I or shouldn't I have Botox?" Orange boutique salon, Bella Spazio, has been honoured as a top ten finalist in the Australian Professional Beauty Solutions (PBS) Awards. Bella Spazio Salon Owner, Lisa Fowler, said the salon competed with 1,600 other businesses to come away with a finalist placing at the awards night held in Darling Harbour. "The awards were about rewarding innovative, creative marketing executed to a high standard," Lisa explained. "We were well placed as the longest standing stockist in the competition and a team dedicated to proactive marketing excellence. "We are coming up to our 10-year anniversary in business next month. Receiving this honour on the eve of such a significant milestone pays testament to our achievement in positioning Bella Spazio as ‘the destination’ for skin and beauty solutions. "The salon and spa industry can be a difficult market. We have come a long way from the original nail salon transitioning into a professional skincare focused spa providing the best advanced beauty therapies and cosmetic treatments. "Our main focus today is offering long-term skin planning solutions. As a business, we realise that just being good at what you do does not always translate into success. It’s a new world out there when it comes to marketing your products and services." In order for Lisa to take the business to the next level, it was essential that she surrounded herself with people who complimented what she was trying to achieve. "In 2015, we engaged the assistance of a marketing agency to streamline our marketing strategy, online presence and overall brand," Lisa said. "Essential to the core of this project was identifying our unique selling proposition - what differentiated us from our competition. "As part of that process we conducted an internal review, staff workshops and client research in order to build on our strengths and develop who we were as a business. "We are focused on fostering strong relationships – with our clients, suppliers and our staff. We know our clients by name, and view them more as part of the Bella Spazio family than a client. "We also take a proactive approach to both our business and our clients, actively seeking out new ways to find, assist and inform clients and grow the business. "Our staff truly are the key ingredient to our success. We have loyal, dedicated and talented staff who treat the business as their own. "Our social media following has significantly increased based on our consistency, and we are now aware of the content that our clients and social media followers love to see based on insights, analytics and feedback. "By ensuring we are promoting both educational and sales focused content, we have been able to maintain a strong following and achieve a high level of engagement and digital reach." IPL - Not just for Permanent Hair Reduction. IPL (Intense Pulse Light) for Permanent Hair Reduction is definately on the move, & well & truly taking over traditional methods of hair removal such as waxing & shaving, with amazing results. Although IPL treatments are able to provide outstanding results for Permanent Hair reduction, did you know that IPL can also treat a wide variety of skin concerns as well? IPL Photo Rejuvenation is on of the most modern light- based skin therapies. It can be utilised to treat and correct particular skin concerns such as vascular lesions, pigmentation and acne. Ageing skin can also be treated to reduce fine lines and wrinkles by targeting collagen & elastin within the skin. It can also be used to treat Rosacea. You might of heard alot of buzz in the media about "photo facials?" Photo Facials or Photo rejuvenation have become so popular as it is a relatively simple and straightforward procedure, with little recovery time or side effects due to the low level of invasiveness. There are so many benefits to having IPL Photo Rejuvenation. There is little to no recovery time, it works amazingly to treat your skin concerns, as well as the added benefit to combat the effects of ageing. IPL is an acknowledged, long lasting solution and offers results of clear, healthy and beautiful complexion. Overall IPL Photo Rejuvenation is safe, easy and highly effective with relatively affordable cost per treatment. It;s conveinance and overall success is why it is becoming one of our most requested treatments. It's that time of year again when the temperature drops and cold winds, central heating and low humidity can dry skin out, leaving it vulnerable to itchiness and flaking. It can also aggravate conditions such as eczema and dermatitis. Dry skin typically experiences a breakdown of the skin barrier functions due to inflammation, as well as a build-up of dead skin cells. The number one solution is to keep skin well hydrated. Eat plenty of essential fatty acids (EFAs), particularly omega-3 (found in avocado and oily fish) and omega-6 (found in nuts, wholegrains and flaxseed oil), which keep skin hydrated and clarified from within. You will need to be using a gentle cleanser that won't strip the skin, followed by a quality moisturiser that will dose skin with lipids and reinforce its protective barrier. It is vital to exfoliate weekly to slough away the build-up of dead skin cells and by doing so you will allow your products to penetrate deeper. When skin is cold it doesn't function as well, so the natural shedding process slows down. Products can become less effective, as the barrier of dead cells prevents absorption. It is imperative to be using a cosmeceutical range at this time as it will penetrate down deep within the epidermis to really combat dryness and dehydration as opposed to an over the counter product that will only work on the superficial layers of the skin. The best range for you to be using at this time of year is the Image Skincare Vital C range. This range is specifically designed for environmentally damaged, dry/dehydrated, sensitive/rosacea-prone skin types. A rich blend of natural botanicals and anti-oxidants soothes and protects the skin.